Arreya’s technical team began testing on a freezing issue reported by users in April 2018. We pinpointed the issue to some Google Chrome OS devices that would crash or freeze until rebooted. We immediately reported it to Google and began supplying Google with testing reports so their technical teams could recreate the issue. For our users affected by the issue, we found a work around that would keep some of them going for a while by triggering the affected devices to automatically reboot once a day. It was not triggered by a certain type or amount of digital signage content but would occur randomly, usually taking less than 24 hours to occur. 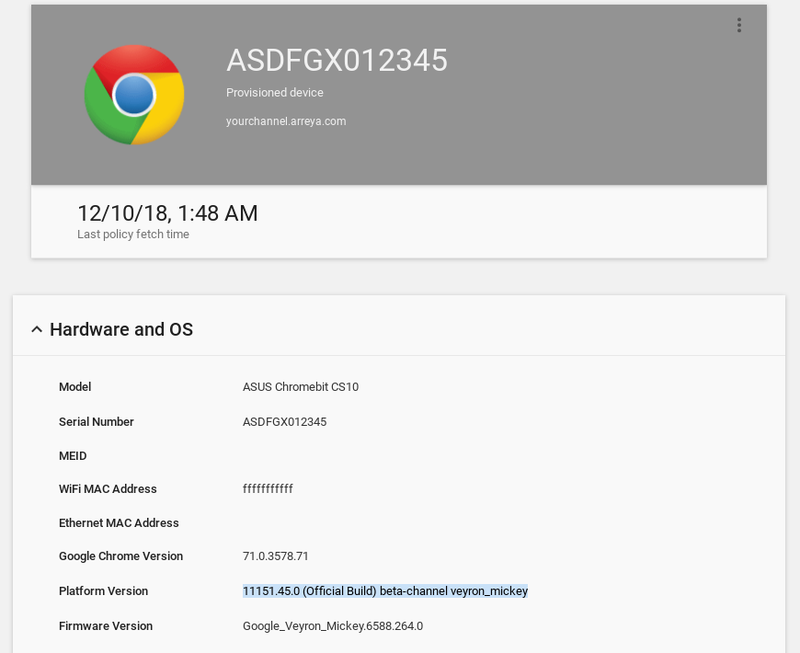 The issue seemed to only affect the ASUS Chromebit and the AOpen Chromebox Mini and was not caused or triggered by Arreya. The issue was extremely difficult to reproduce, but Google engineers identified the issue and released a fix in November 2018. As of late November, the issue is fixed and verified in the latest Developer release and should be rolled to Beta and Stable around the second week of December 2018. Users with automatic updates turned on will not need to do anything, and will receive the update as soon as it is available to the platforms. If Beta channel has the release before the stable promotion date, users can change the release channel to Beta via their admin console and force the devices to receive the update. Switching the devices to the Development channel is not recommended for production use, but users can test the fix in the Development channel of Chrome. How can I see if my Chrome Device has the update? In the Hardware and OS section of the device information, you will find information about the software versions of the Chrome device. The Platform Version must be above 11151.31.0 to have the update. The common denominator between the ASUS Chromebit and AOpen Chromebox Mini is the processor they use, the Rockchip RK3288 with the ARM® Mali™-T764 GPU. In early 2018 Chrome developers started merging in driver updates from ARM for their Mali graphics processor. In April, Chrome developers noticed an issue with a different platform; a new power saving feature was enabled by default which didn’t play well with the rest of the processor and Chrome OS, this feature was disabled for this platform. Unfortunately this platform used a newer Linux kernel version (4.4) so the fix wasn’t applied to the platforms we used (3.14). Investigating and testing the issue was difficult due to a couple of factors. The crash seemed to occur randomly and wasn’t triggered by any one thing due to the nature of the issue. The issue was caused by a feature automatically enabled in the new driver that delegated power management between the driver and the platform. This didn’t play well with the rest of the hardware/software combination and would cause instability during voltage/frequency transitions. Any normal use of the GPU will cause a voltage/frequency transition, and could cause the crash to happen.